Defensive end Fletcher Cox goes after Falcons quarterback Matt Ryan during the Eagle's season opener. The Eagles travel south to take on the hot Tampa Bay Buccaneers on Sunday. 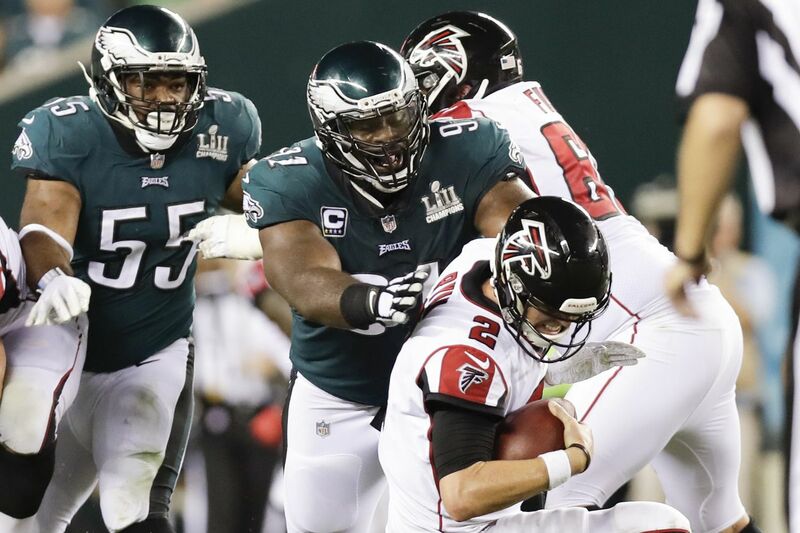 The Eagles' ground game got off to a slow start against the Falcons last week. They had just 16 yards on 10 carries in the first half. Jay Ajayi had just three first-half carries. In the second half, the offensive line took control and the Eagles averaged 5.7 yards per carry. Ajayi rushed for 51 yards on 12 carries in the second half and had two rushing TDs. While Ajayi figures to get the heaviest workload as long as he stays healthy, Doug Pederson will continue to rotate him with his other top two backs: Darren Sproles and Corey Clement. The Saints ran the ball only 13 times against the Bucs on Sunday, but the Bucs held them to 3.3 yards per carry. The Bucs' line is anchored by six-time Pro Bowl DT Gerald McCoy. They finished 24th in opponent rush average (4.3) last year, but added ex-Eagles Vinny Curry and Beau Allen and ex-Giant Jason Pierre-Paul in the offseason. LBs Lavonte David and Kwon Alexander are very good sideline-to-sideline defenders. Nick Foles will make at least one more start before Carson Wentz returns. He struggled against the Falcons, completing just 19 of 34 passes and averaging 3.4 yards per attempt, his lowest average since 2013. Foles didn't complete a pass that traveled more than 10 yards in the air and had just one completion of more than 10 yards (18 to Zach Ertz). With Alshon Jeffery still recovering from rotator cuff surgery, Foles needs bigger contributions from Ertz and WR Nelson Agholor than he got last week. They combined for 13 catches vs. the Falcons, but for just 81 yards. The Eagles had only six passing first downs. The Bucs had the NFL's worst pass rush last year. They finished with just 22 sacks. The additions of Curry and Pierre-Paul should help. But they didn't get much pressure on the Saints' Drew Brees, who completed 37 of 45 passes and was sacked just once (by Curry). Eagles quarterback Nick Foles was 19-for-34 passing against the Falcons. The Bucs finished 27th in rushing last season, averaging just 90.6 yards per game and 3.7 per carry. They selected USC RB Ronald Jones in the second round of the draft, but he struggled this summer, averaging 0.8 yards per carry. He was inactive in Week 1. That leaves 5-foot-11, 225-pound Peyton Barber as the Bucs' top back. Barber rushed for 69 yards on 19 carries vs. the Saints. He averaged 5.1 yards per carry on first down, which helped the Bucs stay out of a lot of third and longs. Ten of the Bucs' 13 third-down situations were 6 yards or shorter. The Eagles held opponents to 3.37 yards per carry on first down last season, fourth best in the league. The Eagles gave up 20- and 11-yard runs to the Falcons on their first possession last week, but held them to 2.7 yards per carry the rest of the game. They'll be getting LB Nigel Bradham back this week, and that is going to make running against them only that much more difficult. Filling in for suspended Jameis Winston, Ryan Fitzpatrick had one of the best games of his career vs. the Saints, throwing for 417 yards and four TDs. Give the 36-year-old QB weapons, and he can be very effective. And he's got lots of weapons, including WRs Mike Evans, DeSean Jackson and Chris Godwin, and TEs O.J. Howard and Cameron Brate. The 6-5, 231-pound Evans, who has had 1,000-plus receiving yards in each of his first four seasons, is a major matchup problem. Ex-Eagle Jackson is almost 32, but still is a vertical threat. He had five catches for 146 yards and 2 TDs vs. the Saints before leaving the game with a concussion. And Howard and Brate combined for 12 TDs last year. But the Eagles pass rush isn't going to give Fitzpatrick the kind of time he had against New Orleans. The Eagles sacked Matt Ryan four times last week and held him to zero TD passes and his lowest completion percentage (48.8) in seven years. Ryan was 1 for 9 in the red zone and 6 for 13 on third down. Ryan Fitzpatrick passes in the first half against the Saints. P Cameron Johnston had an impressive NFL debut last week. He had a 52.2-yard gross average on six punts and a 47.0-yard net. His gross average was the best by an Eagles punter with five or more attempts in a game since Mat McBriar in 2012 (56.6). PK Jake Elliott converted 26 of 31 FGs last season and was 14 for 16 from 45-plus yards. All four of his kickoffs last week resulted in touchbacks. PR Darren Sproles looked good in his return from a torn ACL, averaging 9.7 yards per return. Bucs PK Chandler Catanzaro, who is in his fifth year in the league and first with Tampa Bay, has an excellent 84.0 career FG accuracy rate. He was 2 for 3 vs. the Saints, missing a 44-yard attempt. P Bryan Anger was 27th in gross average and 26th in net average last season. PR Adam Humphries has a 9.5-yard career average, but returned just six punts last year. He had a 16-yard return Sunday. The Eagles had three extra days of rest after playing in the Thursday night kickoff game. Their defensive-line depth should benefit them in Tampa's expected 91-degree heat and 70 percent humidity Sunday. Buccaneers receiver DeSean Jackson (11) pulls in a touchdown reception in front of Saints cornerback Ken Crawley. DT Fletcher Cox: He spearheaded the Eagles' dominant pass rush vs. Matt Ryan and the Falcons, getting a sack and four hurries despite nearly constant double teams. QB Ryan Fitzpatrick: Threw for 417 yards and four TDs against the Saints and also ran for a TD. TE Dallas Goedert: The rookie played just 17 offensive snaps last week. Targeted four times, he had one catch for 4 yards and had a pass knocked out of his hands for an interception. LB Kwon Alexander. Struggled in coverage against Saints RB Alvin Kamara, who had nine catches for 112 yards and a TD.